Please check our new official Fire Checkout website for both Magento 1 and 2 versions at Firecheckout.net. The checkout process is by far one of the most complicated, yet most important parts of any e-Commerce website. With our Magento one step checkout you’ll be able to offer your customers a quick and easy way to complete their transactions that they will appreciate. Checkout processes that involve many steps and form elements that are confusing, tedious or frustrating for the customer leads to an increase of shopping cart abandonment and losing those customers. We know that one of the easiest and best ways to help you keep your customers happy is to provide them with a simple checkout form. When your visitors are able to place their orders quickly and without instance, your sales will immediately increase. Fire Checkout provides full support for all payment and shipping methods, which means that there will be no core modification needed to install your new one-page checkout solution. Improve your store checkout process and increase your sales today with Fire Checkout. Apply less effort and get more customers. Our extensions supports both Magento Enterprise and Community editions. Start improving your store today and achieve an immediate increase in sales with FireCheckout, along with our wide variety of Magento templates, Magento themes and extensions here at Templates Master! Magento 2 version of Fire Checkout is available at Swissuplabs.com. Find out more information and reviews about our module at Magento Fire Checkout extension page. Either you are already running your store or just building a new one, installation of a new Magento module can be a challenge. That is why we offer free installationLooking for better services, so you can focus on your business and not on technical issues. Our team will install and configure Fire Checkout for you within 24 hours. Our extension works both with Magento Community and Enterprise edition. According to our experience it's difficult to find Magento store that use just few modules so we decided also to offer Free integration and third party conflicts resolution. So whenever you buy Fire Checkout you can be sure that it will be working on your store or you get refund. Got conflict with any extension from other developer then simply request third party modules integration for free! We are proud to introduce flexible and powerful one step checkout layout for your Magento Community or Magento Enterprise store. This design was created based on analysis of best and most successful online USA and European stores. Fast checkout based on Ajax updates! Fire Checkout is provided with easy to use Ajax shopping cart block on checkout page. It allows your visitors to edit shopping cart page without leaving checkout page. You can easily change design of products listing and enable products images and description fields in order to provide more information to your customers. One more powerful features that helps to improve your checkout process. Based on MaxMind library geolocation modules allows to locate users country, city and state and prefill main customers address fields. One of the recent features added to our Fire Checkout module. Provided Google address autocomplete integration and allows to complete address line while customer is typing it, using geolocation technology and Google technology. 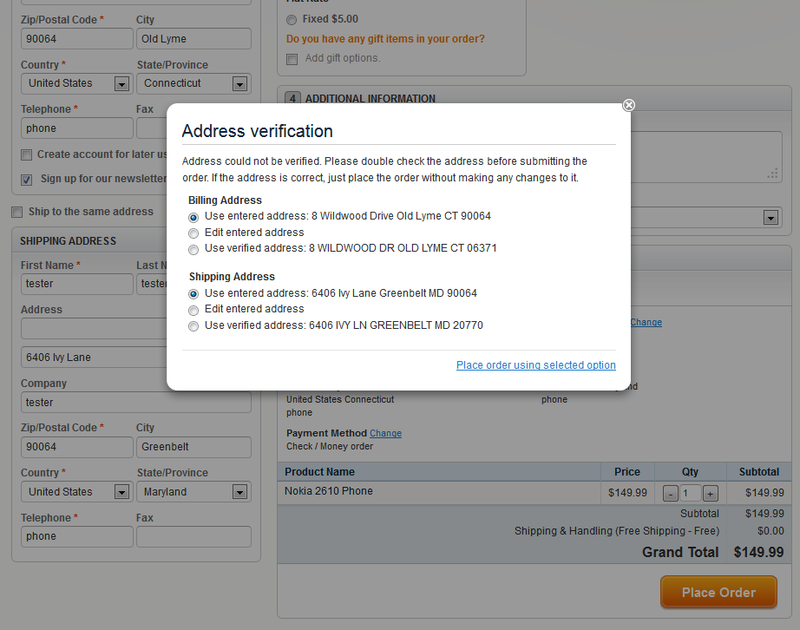 Decrease number of orders with wrong delivery address with USPS address verification. This feature requires USPS shipping module installed and configured. Allow your customers to set delivery date for their orders. This part of Fire Checkout module provide you full control over delivery date and allows to select available dates and time ranges and set dates that should be excluded from the list. Default Magento checkout process doesn’t allow to enter discount code on checkout page. This missing feature was greatly decreasing conversion. Our module allows to apply discount codes right on the checkout page using all 3 checkout templates provided with Fire Checkout. You can easily enable or disable Newsletter subscription block or set default status for newsletter checkbox right from admin interface. In case you want to add social login feature then you have nothing to worry about. Fire Checkout is fully compatible with our Social Suite module and allows to login using social accounts when both modules are installed together. Fire Checkout allows to select one of 2 classic layouts. You can either use minimalistic 3 column layout or more user friendly 2 column layout. Both layouts provide responsive design and works on mobile and tablet devices. Our checkout extension was first module that provided responsive design right out of the box. Fire Checkout is fully optimised for mobile devices and tablets devices. Also you have additional feature that allows to disable our module for mobile devices. Our module provide complete support for Magento Supports Terms & Conditions block. Our extensions provides 2 different display type so you can configure your terms design to better fit your site. Allow your customers send comments for their orders using Fire Checkout comments feature. Customers orders comments can be easily added to order notification emails and checked in order admin interface. This feature allows to get customers feedback and increase customers satisfaction. Fire Checkout extension provides complete control over customer address fields. You can enable or disable fields and change sort orders right from config section. No need to edit template files. 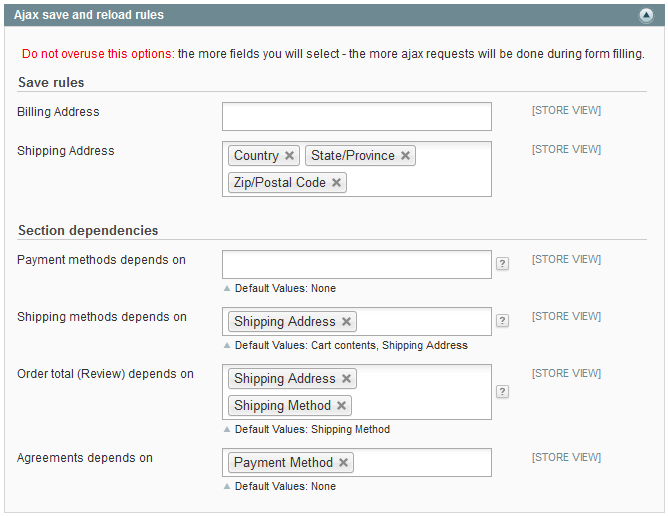 Our free custom checkout fields module allows to create up to 5 custom fields on checkout page. For example you can add such field as “How do you hear about us”. Our extension supports next input fields types: textarea, input, checkbox and select input fields. Custom fields will be shown in your order emails, pdf invoices and customer order view. Our extension comes with the free order attachments module. It will help customers to easily attach files to their order. All attached files are protected from public access and are accessible via private generated links. The module is rendered in additional information section. The module allow to control allowed file extensions to make upload process more friendly. Attachments are visible on the Guest Order View and Customer Order View pages. Attachment links can be easily added to the email templates. Provide 1 click checkout magento feature for registered customers! 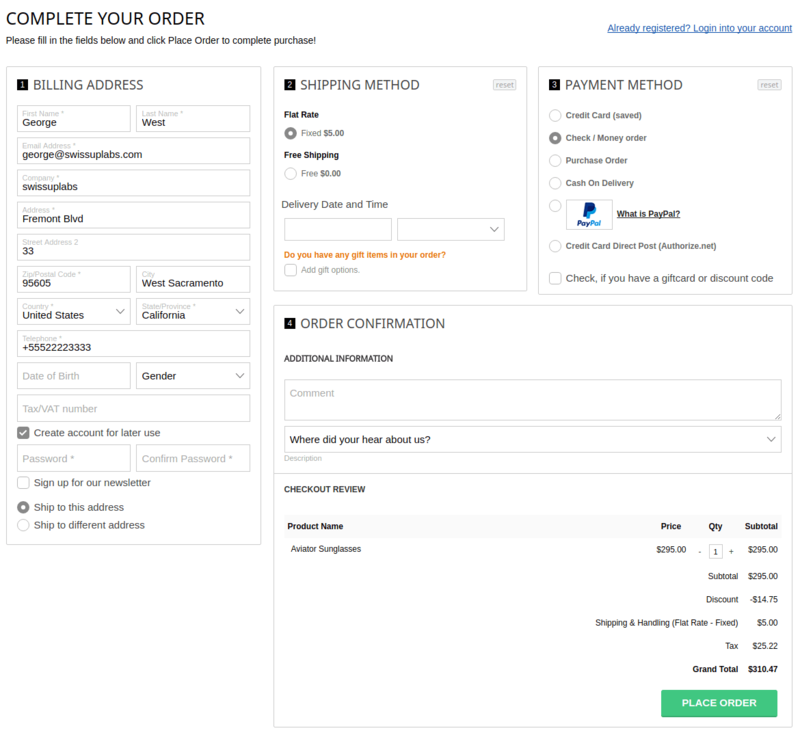 Help you customers to place orders faster using 1 click checkout feature. This feature is available for all registered customers and all payments methods that doesn’t require additional input. Unlike modules from other companies our checkout extension code is 100% open source. You can edit and check any part of our code and be sure that there is no suspicious code is added to your checkout page. 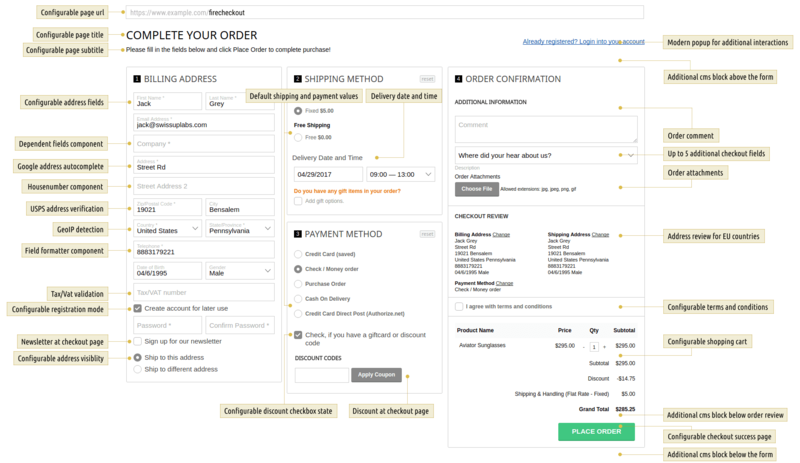 With Fire Checkout you can easily build the checkout page friendly for all users worldwide. Our module is RTL compatible. Now you can offer your easy-to-use checkout page to Arabic/Hebrew speaking customers. The Fire Checkout layout is automatically switched for all languages written in a Right-To-Left (RTL) direction. That provides the best usability for users. Payment methods: 2Checkout_Payment, Adyen_Payment, Bitpay_Bitcoins, Billpay, Billmate, Braintree, Craig_Tco, Customweb_PayUnity, Ebizmarts_SagepaymentsPro, Ebizmarts_SagepaySuite, IntellectLabs_Stripem, IWD_OPC_Signature, Klarna_KlarnaPaymentModule, MultiSafePay_Msp, Netresearch_Billsafe, Netresearch_OPS, Paymill, Payone_Core, Phoenix_Ipayment, Phoenix_Wirecardcheckout, Radweb_Stripe, SVMPayment, TemplateTag_Stripe, Vaimo_Klarna. Shipping methods : Aicod_Italy, Amasty_Deliverydate, Bpost_ShippingManager, DPD_Shipping, Infostrates_Tnt, Emjainteractive_ShippingOption, IrvineSystems_JapanPost, IrvineSystems_Deliverydate, IrvineSystems_Sagawa, IrvineSystems_Seino, IrvineSystems_Yamato, Kiala_LocateAndSelect, Magestore_Storepickup, PostcodeNl_Api, Smart_POST, Storepickup, Tig_MyParcel, TIG_PostNL, Webshopapps_Desttype, Webshopapps_Wsafreightcommon, Wyomind_Pickupatstore. Other methods : Emja_Taxrelief, Geissweb_Euvatgrouper, CraftyClicks, Webgriffe_TaxIdPro, Juicy_Geoip, MageWorx_MultiFees, GCMC_GiveChange, Rack_Getpostcode, Symmetrics_Buyerprotect, Amasty_Coupons, Built-in coupons, Magento EE coupons, AW_Points, AW_Rewards, J2t_Rewardpoints, Magebuzz_Rewardpoint, MW_RewardPoints, TBT_RewardsPoint, AW_Storecredit, MageWorx_CustomerCredit, Amasty_OrderAttr, RedPandaPlus_OrderAttachments, Inchoo_SocialConnect, TM_SocialSuite. Available in 14 languages: English, Arabic, Chinese Simplified, Dutch, French, German, Italian, Japanese, Korean, Portuguese, Russian, Spanish, Swedish, Norwegian. Fire Checkout fully supports RTL. Your theme must add dir=rtl attribute to the html tag. We know that usually developers spends a lot of time looking for the most suitable solution. 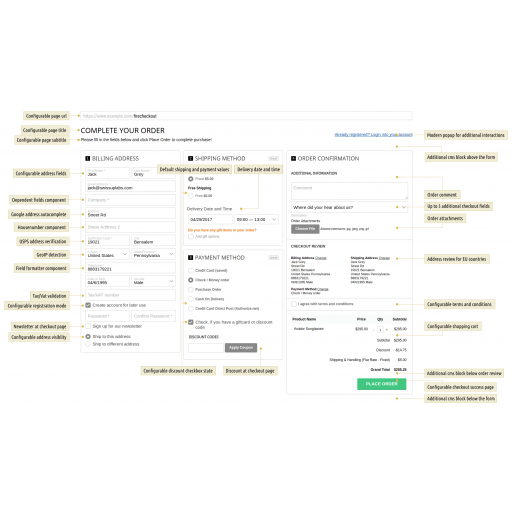 Our team analyzed most popular one step checkout extensions and created a feature comparison table that will help you to make your decision. Trusted by more then 5000 stores! 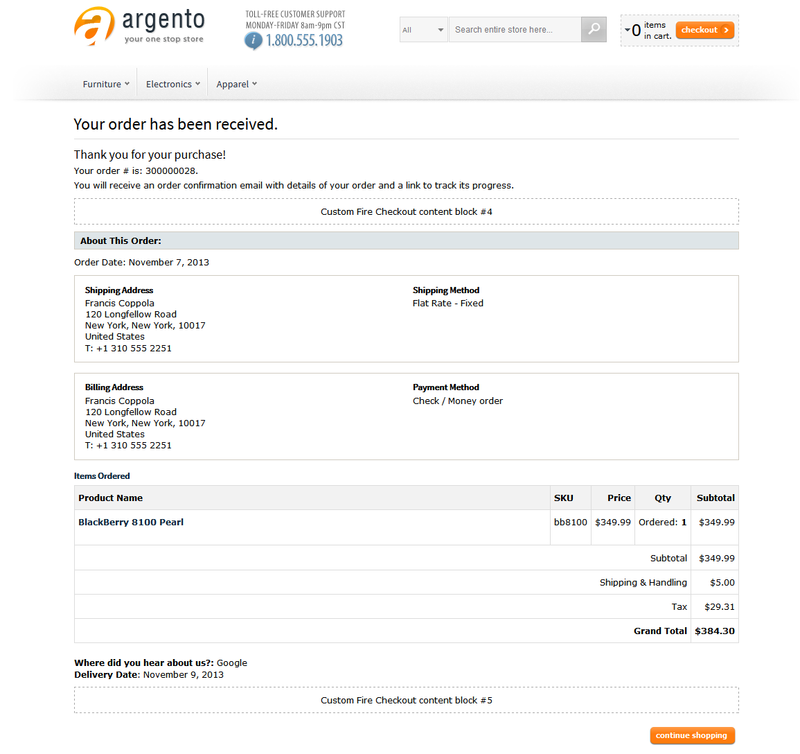 And much more with our Magento one step checkout! Improve your sales. According to clients case studies sales goes up from 10% to 70%. Multiply Store license. You can use Firecheckout on several stores hosted on same server. Support user's country and city auto-detect with geolocation technology! Use on multiple domains of same installation! Our fanatic support will do everything you need to solve your problems. Checkout is one thing you don't want to mess around with. Any point of failure here WILL cost you. Firecheckout is pretty much optimal and bulletproof out of the box. It created an instant improvement for us. It is configurable in just about any way you could want and compatible with all of the other industry leading extensions that keep us on Magento rather than paying the piper for SAAS. Responsive mobile functionality is a thing of beauty for us as well. This extension is worth every penny. This is best OPC I've used so far.I was using "check it out" previously but there was a seriously annoying bug and the developer didn't seem to care. Firecheckout is easy to configure, gets frequent updates, and developers actually answer questions. The only one complaint I have is the default frontname (checkout url) is firecheckout. I wish they would simply default it to checkout. I realize you can change this relatively easily but each update will undo your changes and unless you remember to edit the config.xml every time it's easy to forget that. I think it's the best extension!!! Realy must have! This one page checkout is great! It easily allow clients to fill up their particular details in just one page, reduce the steps required towards the place order button. It is definitely very helpful to our clients and I want to say your extension is great! 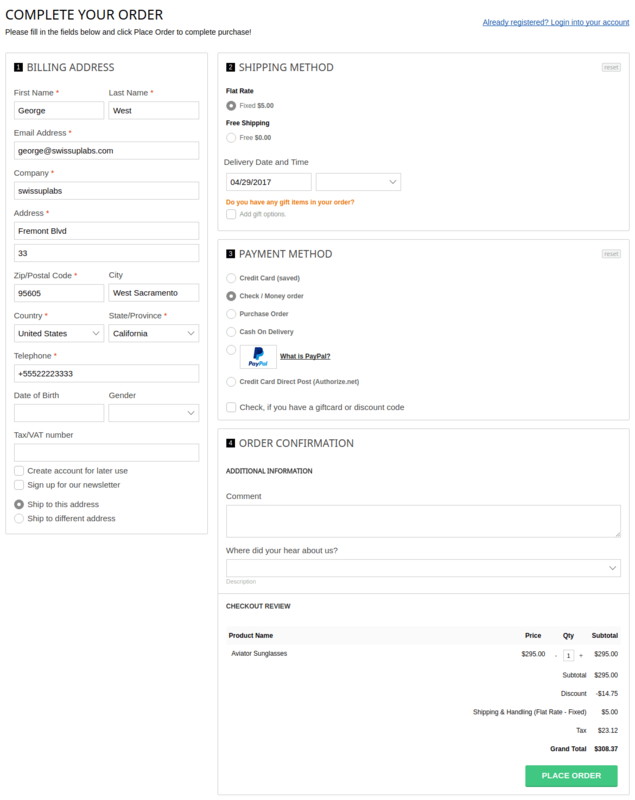 If you are looking for quality, well design and coded checkout for your magento store The Fire Checkout is a definietly the checkout to have. Very helpful stafff and quick installation. They helped to fix a broken magento checkout in the first place. 100% recommended! It's rare these days to find a Magento extension that does exactly what they tell you it does. Sometimes they exaggerate features a little (just a little, of course), sometimes the thing simply doesn't work. This one works just as you expect it to. Easy and flexible to configure, nice looking, and plays well with others. Want to have a "Comments" field on the checkout form? You got it. Show Terms & Conditions on a popup? You got it. Create your own custom fields (e.g., "How did you hear about us? 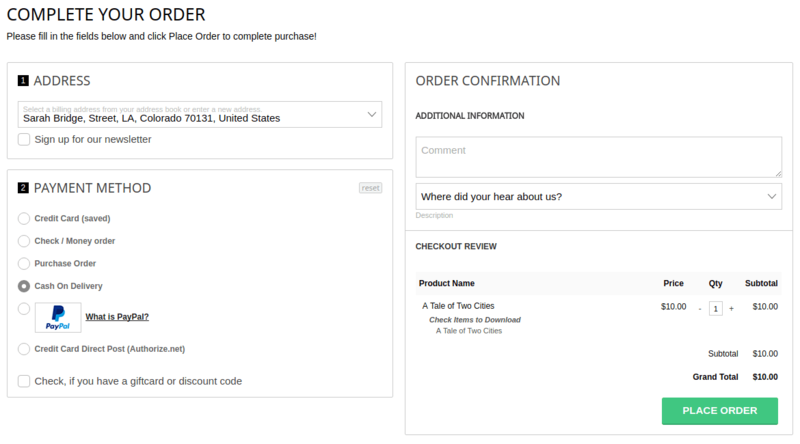 "), or insert text (CMS block) on the top/bottom of the checkout form? Well, you know by now: you got it. The "success page" which displays right after the order is submitted is a great-to-have, and I love the address autocomplete feature, which makes your site look like the big guys'. And frankly, I'm just scratching the surface here. But then it comes their customer/technical support... What can I say? Customer service like in the good old days (I'm in my mid-60s, so I should know). No rubber-stamped or automated answers, they're always there when you need them, in spite of the large time zone difference (I'm in California). I had some issues while installing the extension on my development environment (on localhost) for testing, and they patiently and diligently helped to identify and solve my problems. Then they even installed the extension on our production server for free! I also asked several (dumb on my part, I should add) questions, and they were quick and accurate with their answers. Never patronizing, you always get the impression that you are dealing with someone on the other end that really understands your issue and genuinely wants to help you. In summary: Don't waste your time looking at other one-page-checkout extensions (which I did). Fantastic customer service and technical support. Responsive and responsible developers. Communications are prompt and very dedicated team. Good, robust and responsive support from their developer. Problem with payment gateway was solve in and within 24 hours, weekend. This is the best checkout module I've used. It made an immediate impact and helped to convert sales, not to mention how efficient it is. View all reviews for Magento One Page Checkout - Fire Checkout 4.3. More detailed information about recent updates is available at our Magento extension documentation site. Added ability to add attachments from order view page. Security fixes to _isAllowed method. Added compatibility with 'Skip Paypal review step' option, when agreements are used. Fixed unexpected text selection after cart item removing in Firefox. Magento 1.9.1 compatibility. Password confirmation fixed. Added housenumber script, that allows to replace the second address line with housenumber field. Removed popup window sprite image. Css3 is used instead. Unfortunately some of the modules still needs to be edited. But FireCheckout sources is ready to use without any modifications. Improved check for modules enabled status. AddressFields status save: Warning message removed in Magento 1.5.0.1 and earlier. Fixed error in billing form, when Mage_Newsletter module is disabled. Imporved check for Mage_Capcha module. Added check for etc/modules status. Partial Amasty coupons integration. Still needs to edit Amasty_Coupons_Block to change template. Q: Does this extension really support 2checkout payment method? I installed the official 2checkout extension and tried to checkout with Firecheckout but it stuck at the final step (submitting the order) where it redirects to a blank page. A: Yes it should be working fine. Please contact our support so they can check what cause that problem. Q: When will this plug-in be available in Magento 2? Q: Is it possible to keep track with Google Analytics Events on the fields a customer enters during the checkout?According to this page it is possible to send data as soon as a customer clicks on a field: https://developers.google.com/analytics/devguides/collection/analyticsjs/enhanced-ecommerce#checkout-optionsSo I'ld like to know on which field the mos customers leave the checkout-procudure. Q: Since Magento 1.7 it is possible to place a customer in a customer group with a different tax percentage (for example no tax) if he enters a valid VAT ID. Does Fire Checkout support this check aswell when the customer is not registered yet? Q: Is Credit check with credit pass possible?We would like to use an extension that performs credit checks together with Onepage Checkout.After the customer has entered address and shipping method, he chooses the payment method that is available for his country. One of the options is "Open Invoice". If the customer chooses this payment method, an extension called credit pass checks the address with an external service and returns either "yes" or "no" back to magento, meaning the payment method is available or not. If it´s available for the user (user considered trustworthy), the user won´t recognize anything. If the user is likely not to be trustworthy, a message like "Sorry, payment method not available" appears and this payment option is no longer available. 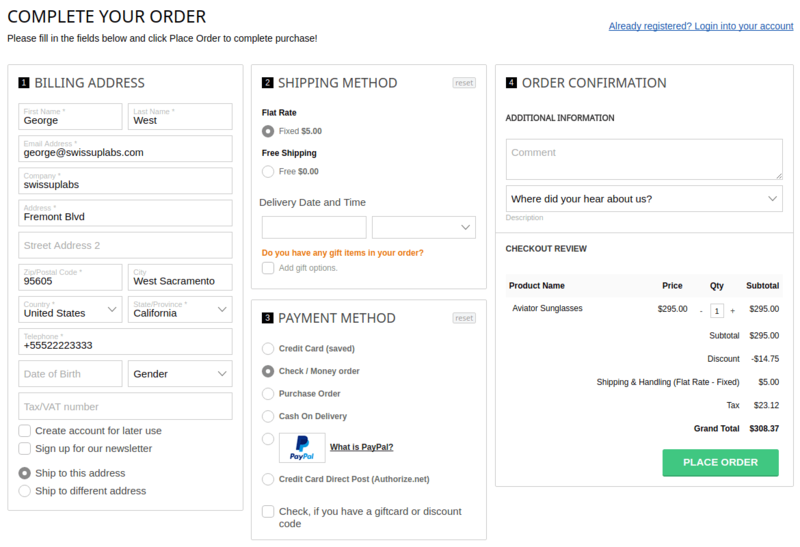 Well, this is how it works with the default checkout process...Do you see possibilities to integrate this with Onepage checkout? Do you have support on how we could code this? A: Thank you for your interest. Your custom extension should be modified in order to be used on fire Checkout but it can work in same way as now. A: We have a similar extension that initiates a credit check in the background. Would be great if Templates Master is willing to add support for those payment extensions. Q: I have created custom customer attributes to my registration form and it saves to the database. However, I need these new attributes (3 in total) to be saved in the firecheckout page (for people who wish to register as the same time as they checkout). How should I go about doing that? A: Sorry can you tell us more about this attributes. Does this attributes are part of shipping and billing info or it's separate attributes? Q: Hello - Does Firecheckout work with PayPal Payments Advanced? I was using another OPC & switched to Payments Advanced only to find out that the OPC does not support it. It works with all other PayPal payment options except the Advanced.The developer told me "Paypal Payments Advanced has not been integrated with our module yet. We also no longer offer integration service for this module since we have suspended this module to focus on our Omnichannel solution now." So, now I'm stuck having to find/purchase another OPC. A: Hi,thank you for your interest. It works right out of the box. Also we do offer free integration with third party modules. Q: Which PHP versions are supported? Does it support PHP 7.1 or 7.2 as well? A: Hi, it should be working without any problems. In case of any conflict it will be fixed by our support team. A: 1. Yes sure you can do it using our social suite module.2. You can hide it with css..3. Yes sure. Q: Hi, in version 3.10.0, under upgrade notes, it mentions better integration with FireGento (Mage Setup). What exactly was enhanced in the integration? The biggest issue I saw before was that when a customer clicks on the Terms and Agreements and the screen with them pops up. In previous versions as well as 3.10.0, there is no button or link to accept them after reading. The customer has to close the pop up, and manually select the checkbox. I believe that without Firegento, in the pop up, there was a link or button to accept the agreement. Could you let me know. Thanks. ORlando. Nice solution for seasonal discount campaigns and promoting new product. Creation of professional looking and effective call-to-action labels. Improves your store design. Optimised for stores with big products catalogs by using indexing process.